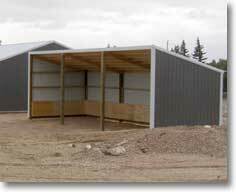 A single slope building is the simplest of shed designs, with a wide variety of ultimate functions. From a lean-to shed for an animal shelter to a commercial building or even a multi-level home, a single slope building may be the ideal answer for your needs. Despite its straightforward design, a single slope roof can be the best choice, or quite the opposite for functionality and price. A do it yourself barn building kit attracts many folks to choose a single slope roof design, thinking it will be quick and easy to erect. It may very well be both of those, and cost effective too, but let’s look at the options. Width is one of the most important deciding factors for any loafing shed. Because the single slope building most often has rafters for the roof framing instead of trusses, width is an important variable. As the width climbs above 30’, the rafter length is stressed to support a much larger load. The rafters or LVL’s become longer, larger, heavier and as a result of all of these, more expensive. LVL’s can be used which are lighter, stronger and can be built to carry large roof loads. But again, this comes at a cost. Rafters may have to span larger distances, especially if the single slope roof is clearspan, meaning it has no interior supporting poles. This shed design requires the rafters to carry the entire roof load without the added support of webbing, such as trusses would have. Again, this is not a problem if the width of the building is less than 30’. Once you get to 36’ in width, you are looking at having to add interior posts to your shed design, which may or may not be favorable towards the building’s intended use. If you are using your single slope building for a loafing shed and wish to build stalls using the poles, width may not be a deciding factor. Poles can often easily be hidden in walls between rooms of houses or commercial buildings. Perhaps there is an “open” sidewall with the open bays providing natural separations for storing tractors, boats and lawnmowers or other yard equipment. Another misconception about single slope buildings is they will provide lots of second story storage or living space. One thing to consider is the relationship between the eave height, the width of the building, and the slope of the single slope roof itself. If you choose a wide building with a fairly flat roof and low eave height, the upper story will be limited due to the roof slope and low eave height. Keep in mind the roof slope tells you how many feet the roof “goes up” for every 12’ in building width. We have many folks who want a 12’ wide building with a 4/12 slope and wonder why they can’t stand up in the upper portion of a building. Using this slope for an example, a 12′ wide building only slopes up 4′ at the highest point. You can quickly see you would need a building at least 16′ tall on the low side to make any loft space practical in this example. Take a piece of paper, draw out your floor plan, and then apply the roof slope in relation to the width and eave height. By code you are required to have at a miniumum 7’8″ of space for a loft. And don’t forget stairs! You need adequate room for the stairs to rise up to the upper level without taking up too much downstairs space, while allowing for head room so you aren’t banging your head as you enter the loft. All this talk about roof slopes can be confusing…Ask one of our highly trained building designers help you quote pole barn kits. Need some help with your barn building kit design? Call one of our Building Designers today to discuss what you want. You may opt to have them draw you a sketch or two before you get a quote. You can get as many quotes as you need on your animal shelter, house or open sided storage building at no charge! Call 1-866-200-9657 for help designing your next loafing shed.